It's possible you don't fully understand Alex and my grocery store thing. We may not go to a lot of fancy dinners or movie dates, but every single weekend, the two of us go to at least one grocery store together and make assholes out of ourselves. It's kind of like our weekly date. This particular date to the grocery store was epic, like attending a ball or something. This weekend, however, I had plans that conflicted with grocery shopping. When I told Alex, he got a sort of panicked look on his face and said, "That means...I'm going to have to go to Whole Foods by myself." By all reports, it did not go well. Goddamn, I love that guy. 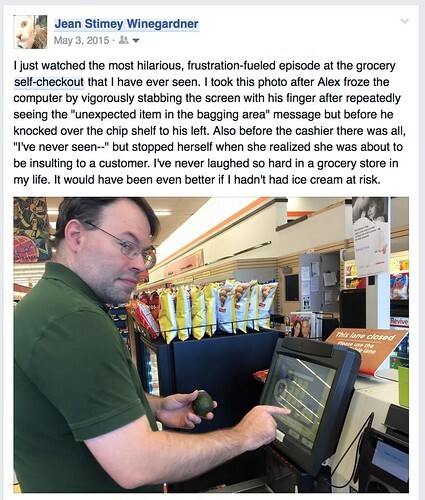 So instead of taking the cart back to where he found it, he looked around furtively, carefully picked his stuff out of the cart and backed slowly away from it, returning to the scene of the crime, where he reclaimed his untouched cart, put his stuff in it, and carried on with his shopping. He at least had the decency to feel bad about it. I still don’t know what that penultimate message was supposed to say. I think he was having a panic attack. Therefore, even though the two of us are terrible at the store together, it turns out that we're even worse alone. Or at least Alex is. 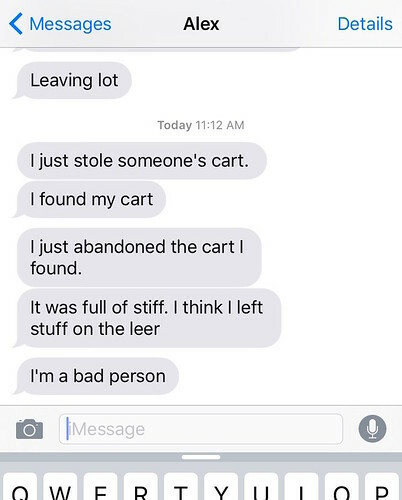 Heehee, my friend just texted me the other day to say she had taken someone else's cart; she will be reassured to know that this is more common than she thinks. Whenever I go grocery shopping, I miss at least one staple. We might need milk, eggs, cheese, fruit, and cereal. I will come home with milk, yoghurt, crackers, fruit, toilet paper, and cereal. So it's a useful trip...it just doesn't meet our needs. My husband prefers to grocery shop by himself. Jean, this is in reply to your earlier posts. First, congrats on your running progress! I really need to lose weight, for health reasons now, and will probably never run. At least I can walk! Pretty much starting from square one here. I love Whole Foods. If you shop the specials and the two store brands, and skip the frozen and prepared foods, it really isn't "whole paycheck" as people still believe. Their produce section is the best in the area, and the fish always looks fresh. I don't eat meat; just don't like it. The salad bar is pricey, but convenient. Someone mentioned Mom's Market. The one on Nebel street is quite nice, and they also have good sales. Their produce section is smaller, presumably because everything is organic. Yogurt and cottage cheese are more expensive than at Whole Foods. I buy frozen vegetables and canned tomatoes at the Giant. SO fabulous that Alex and your friend have each other. So funny. We always miss at least one thing too. Like, we buy it every week, how do we forget it? Jean, thanks! Yes, I am starting with walking, and that is aok. So, Stimey, How Are Those Resolutions Coming?